The BEST Greek Chicken Salad EVER loaded with crazy delicious Pita Croutons and creamy, healthy Tzatziki Dressing! 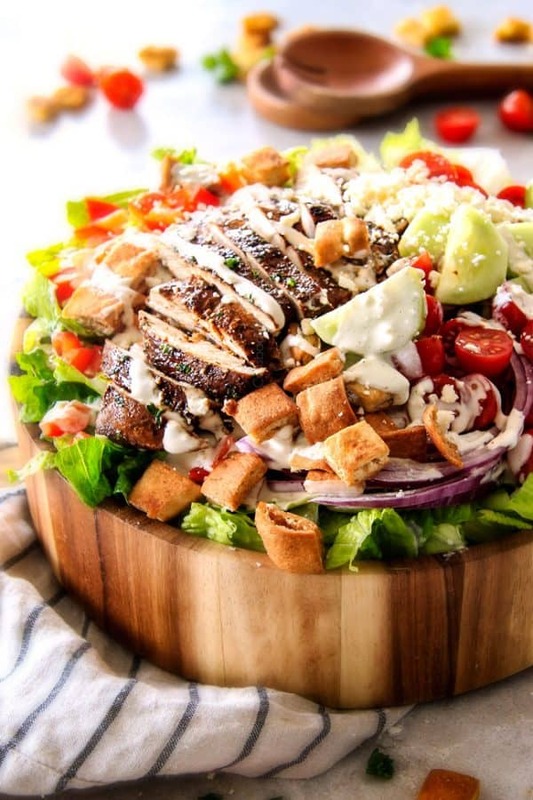 This Greek Chicken Salad is like a deconstructed gyro you will crave for days! Its easy to make, exploding with texture and you can prep all the ingredients ahead of time for meal you can throw together in minutes! Who else looooves Greek Food? 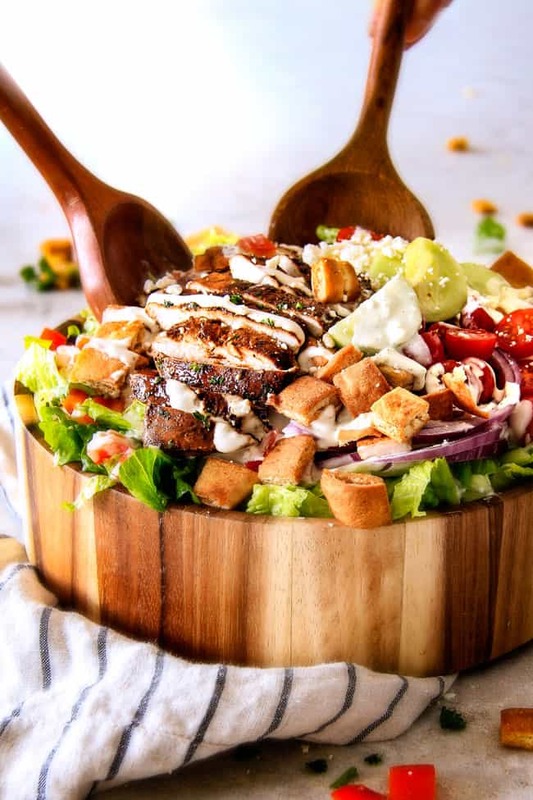 From my Greek Lemon Rice to my Chicken Souvlaki to my Beef Souvlaki, to my Greek Pasta Salad, I just can’t get enough and this Greek Salad is no exception. I often find myself ordering Greek Salad and wishing I could eat only Greek salad. And now you can! With the addition of juicy, marinated Greek chicken, this Greek Chicken Salad transforms into a hearty main dish that is refreshing, light, healthy and filling all at the same time. I also love this Greek Chicken Salad because every single one of the components can be prepped ahead of time for an ideal meal-prep lunch or make ahead dinner! So let’s talk these delicious components, first up, Greek Chicken. A Greek Chicken Salad needs dynamite Greek chicken. I used the same Greek chicken marinade I used in my Greek Chicken Gyro Flatbread Pizza because as I said in that post, it’s a 10 out of 10 in my opinion. 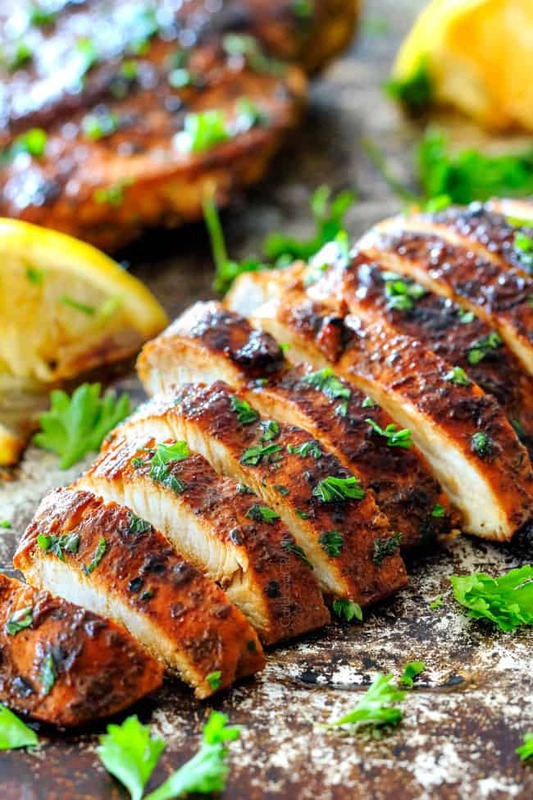 The marinade is a quick whisking of olive oil, balsamic vinegar, lemon juice, and a plethora of pantry spices including garlic, oregano, cumin, basil, and paprika. Can we say FLAVOR?! You will want to devour this chicken plain it smells soooo good and tastes even better. 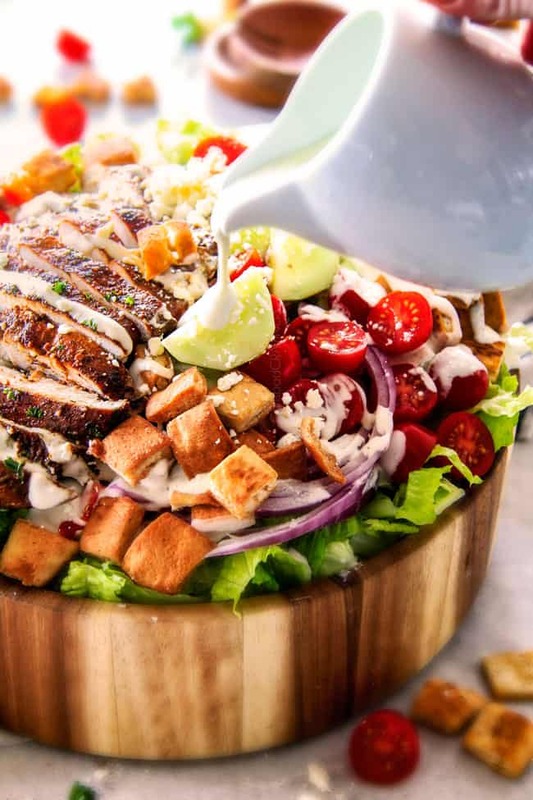 The Greek Chicken Salad itself is comprised of fresh romaine lettuce, thick-cut crisp cucumber, crunchy bell peppers, juicy cherry tomatoes, tangy red onion, rich Kalamata olives, and creamy feta cheese. All these elements combine beautifully for a balance of flavor and texture but if you have picky eaters or want a fun entertaining idea, then consider a salad bar where everyone can pile on as much or as little of their favorite toppings. Everyone is a winner with a Greek Chicken Salad Bar! Now to these AH-mazing pita croutons that taste like seasoned pita chips. 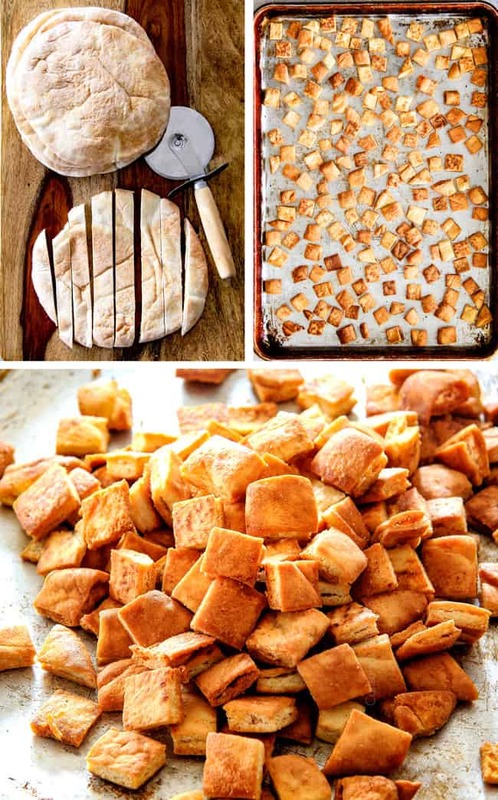 I was so excited about my idea for pita croutons, as I love traditional homemade croutons, and these turned out even more incredibly delicious than I imagined. Simply toss your cut up pitas with olive oil, salt, garlic powder and paprika and bake for 10 minutes and you have pita croutons you won’t be able to stop munching! Now to the best part of the Greek Chicken Salad, the guilt free Tzatziki Dressing! Traditional Greek Salad is served with a vinaigrette while gyros are served with Tzatziki, so I went the gyro route because I LOVE garlic, dill, lemon infused Tzatziki and all its creamy tangy deliciousness. And this Greek salad loves this Tzatziki Dressing. To make your Tzatziki Dressing, first chop your cucumbers and place them in a fine mesh sieve and season with ½ teaspoon salt to help them release their juices for 15 minutes or so. I then use the back of a spoon to press down on the cucumber to get rid of any excess juices. This step is super easy but also super important so you don’t end up with watery dressing. 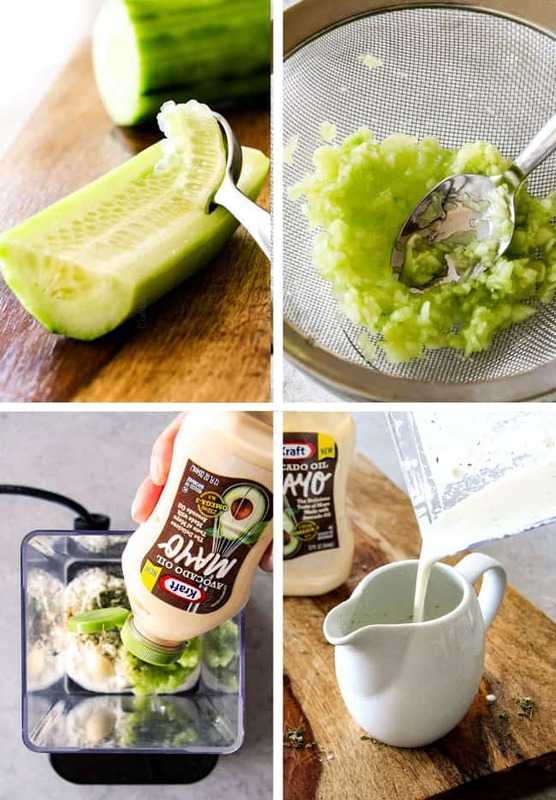 Next, add your drained cucumbers to your blender along with Greek yogurt, sour cream (or more Greek yogurt if you prefer), KRAFT Avocado Oil Mayo, garlic, lemon juice, red wine vinegar, olive oil, dill, parsley, pepper and cumin and blend away to garlicky, herby, tangy, creamy amazingness. You’ll want to refrigerate your Tzatziki Dressing for at least an hour but it is even better refrigerated overnight as it becomes creamier and the flavors become deeper. Oh. My. Yum. You’ll notice I used both Greek Yogurt and KRAFT Avocado Oil Mayo for a little authentic tang and plenty of creaminess. If you aren’t familiar with KRAFT Avocado Oil Mayo, let me giddily introduce you! KRAFT Avocado Oil Mayo delivers the same delicious taste as Real Mayo but is made with avocado oil that contains 232 mg of Omega-3 ALA in every serving! That means KRAFT Avocado Oil Mayo is the perfect healthy swap to replace regular mayo. So now every time you slather your sandwich bread with KRAFT Avocado Oil Mayo or make your mayo based dressings or sauces – you can feel good about eating it! I’ll start with an entire bowlful of Greek Chicken Salad. Looking for more Chicken Salad Recipes? 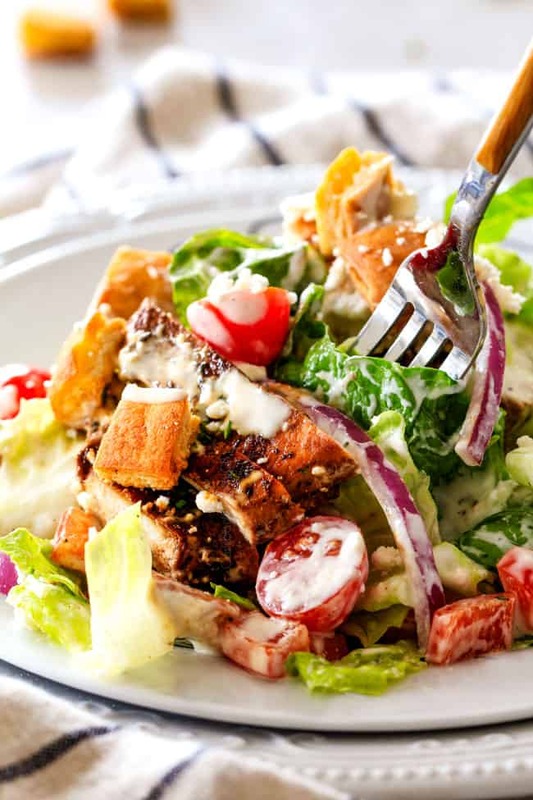 Want to try this Greek Chicken Salad with Pita Croutons and Tzatziki Dressing? Pin it to your SALAD, GRILL, CHICKEN or DINNER Board to SAVE for later! The BEST Greek Chicken Salad EVER loaded with crazy delicious Pita Croutons and creamy, healthy Tzatziki Dressing! This Greek Chicken Salad is like a deconstructed gyro you will crave for days! Its easy to make, exploding with texture and you can prep all the ingredients ahead of time for meal you can throw together in minutes! Prepare chicken according to recipe directions. You can cook chicken in advance and serve cold or cook while preparing Pita Croutons and serve warm according to personal preference. Meanwhile, slice cucumber in half lengthwise and scrape out the seeds using a teaspoon (see picture in post). Chop cucumber and add to a fine mesh sieve and sprinkle with ½ teaspoon salt. Stir and let sit 15 minutes. After 15 minutes, use the back of a spoon to push cucumber down against sieve to release excess water. Repeat several times. Add cucumber along with all remaining Tzatziki Dressing ingredients to a blender and blend until smooth. Add milk, a teaspoon at a time if needed to reach desired consistency. Refrigerate (Best if chilled at least 1 hour, the longer the better.) Dressing with thicken upon standing. Season with salt and pepper to taste before serving. Preheat oven to 400F degrees. Add pita squares to a baking sheet and drizzle with olive oil. Season with salt, paprika and garlic powder. Toss until evenly coated then spread into an even layer on baking sheet. Bake for 10 minutes or until golden. Add Salad ingredients to a large bowl and toss to combine (or create a salad bar). Top with Greek Chicken. If you don't expect leftovers, top with Pita Croutons and desired amount of Tzatziki Dressing . If you are expecting leftovers, then serve Pita Croutons and Tzatziki Dressing separately with individual servings. Enjoy! . I’d love to try this in my baked chicken salad. I love to use the KRAFT Avocado Oil Mayo in my chicken salad. I want to try it in the Baked Parmesan Chicken (the one many people call OMG Chicken). It’s a family favorite! I am most excited to use it in my macaroni salad, or even in tuna salad. I would use it in chicken salad. I’d first use the KRAFT Avocado Oil Mayo in my tuna fish salad.